Our selections of cheeses vary greatly and rotate frequently based on seasons and availability. 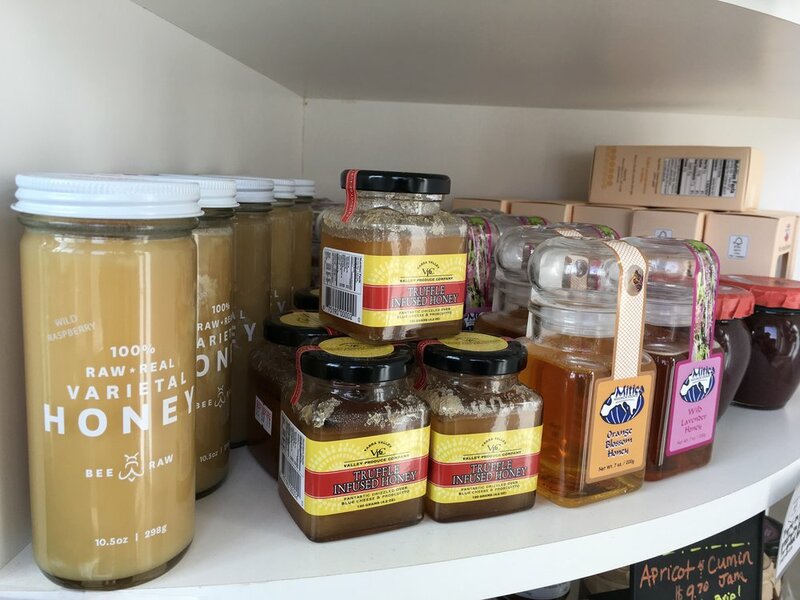 We carry too many varieties to list but if you don’t see your favorites mentioned please inquire so the Cheesemongress can help you locate it if it isn’t in stock! Soft cheeses can have a rind that is sprayed with a culture to make it bloomy or it can be brushed with a brine which is called a washed rind. Whether a bloomy rind or a washed rind, soft cheeses are not pressed or cooked which results in an interior that is creamy and will melt-in-your-mouth. Some popular varieties with our customers are our BRILLAT SAVARIN and several flavors of CYPRESS GROVE GOAT DISCS. Semi-Soft cheeses are either interior ripened or surface ripened. Both are drained mechanically to leave about a 45-50% moisture level but some are heated to remove the moisture, causing them to age from the inside. Others are frequently turned in a salt-water solution, in a cold room, causing them to age from the outside. Our PETITE BASQUE, IRISH WHISKEY CHEDDAR and SPANISH MANCHEGO have been mentioned by our customers as some of our best! There is a numerous amount of cheeses that fall into this category and so many popular varieties. Generally, these cheeses have no rind, a supple texture and a moisture content of about 35-45% due to the cooking process they undergo. Some may not be aged at all where as others can be aged for long periods of time. One of the Cheesemongress’s recommendations is the BEEMSTER XO GOUDA. Some of our other favorites include EWEPHORIA and PARMIGIANO REGGIANO. Commonly called “Blue” cheeses due to the bluish (or greenish) veins that are present in their interior, blue-veined cheeses are very similar to the soft and semi-soft cheeses when it comes to production. The taste differs greatly thanks to the introduction of cultures to the curdled milk to promote the development of mold. These fragrant cheeses are aged to perfection for several months in a humid location. We can’t get enough of these “stinky” treats but realize this cheese can be an acquired taste. So we carry a variety of mild to robust selections including BAYLEY HAZEN, ROGUE RIVER BLUE, SMOKEY BLUE, and ROQUEFORT. These cheeses have a high moisture content of 60% or more. Milk is left out in ambient air temperatures to allow it to curdle naturally. After the whey is drained off, ferments are introduce to acidify the milk. These yummy treats are best consumed soon after production and do not have a very long shelf life. We are pleased to offer a wonderful BURRATA from DI STEFANO and a scrumptious MOZZARELLA, among others. Our Vegan Cheeses are sourced from the company Blöde Kuh and made from cashews! We stock both their cream cheese styled cultured spreads and dips as well as their aged semi-soft wheels. Each morning we make sandwiches with delicious breads, sourced from the Bread Bar, and our wonderful charcuterie and cheese options. We also offer Grab 'N Go boxes, the perfect mix of cheeses, crackers, fruits, olives, and spreads. Both options make for an easy lunch choice & delicious break in your day. We carry a variety of spreads to complement various cheese taste profiles. Some of our popular spreads are Fig, Honey, Mustard, and Apricot. Be sure to inquire which spread will pair best with the cheeses you purchase! We certainly don’t mind letting our fingers get lickably sticky. But sometimes a cracker or a small slice of a baguette are just the thing to bring a little culture to the inner cheese-loving hog. Ask about our selection and let the cheesemonger find the right one for you. These are a nice touch to add some varied flavors to your cheese selections. They can help cleanse the palate between tastings, add to the complexities of some of the aromatic cheeses, or they can just be pretty and add a splash of color to your cheese plate presentation. Let us assist in finding the perfect match. Ok…wait a minute…caramel, you ask? Sure! Why not!? Sweets are a great compliment to cheese. Cheese plates can be a perfect after dinner treat before dessert or even in lieu of! And this caramel…well, let me just say…its absolutely delectable. 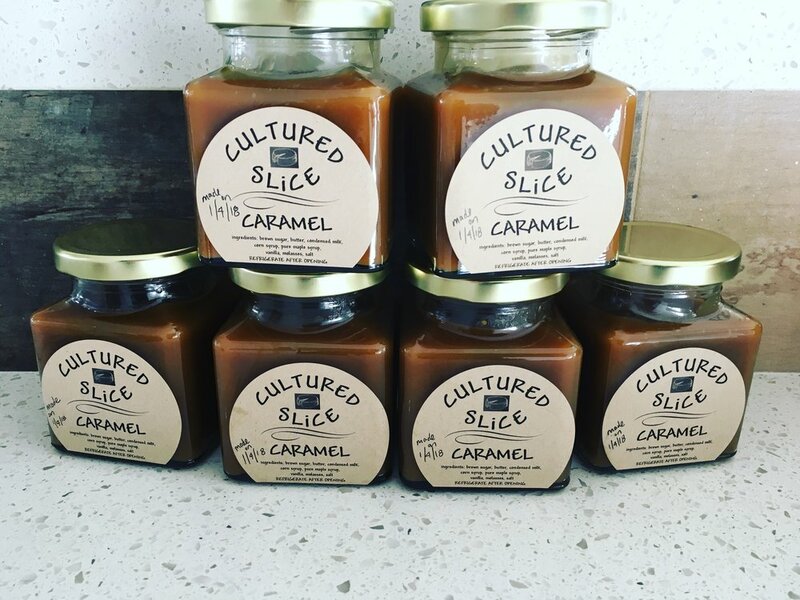 Our caramel is a popular gift item that rarely makes it to the recipient because the purchaser can’t help but indulge. Add it to coffee, pour it over ice cream, drizzle it on a great brie or gouda or fruit…whatever! But be careful…it’s very addictive! Not only do we have bottles of Fiji Water and Perrier, but we stock various flavors of Elixia Sparkling French Lemonade. All perfectly refreshing options to pair with your cheese purchase. Whole wheels of cheese can be aged for years. A cut wheel becomes delicate and more perishable. Cheese needs to breathe to stay alive and tasting its best. Most food storage materials are nonporous and can suffocate the cheese. Suffocation can cause cheese to smell and taste like ammonia and develop surface mold. Two-ply cheese paper mimics a cheese cave environment, allowing proper humidity and oxygen. If you manage to have cheese left after serving it, cheese paper and proper handling will help keep it tasting its best. Cheese makes a wonderful gift choice. Don’t know what to get? Keep it simple with a gift card! Still not sure what to get? Contact us with your questions or check out our made-to-order cheese boards and gift baskets.